Do you need an interpreter? I can help you whether you need an interpreter for conferences or for a small meeting. Thanks to the interpretation you will be able to talk to your interlocutor and understand what they say with the utmost comfort for you. This is the interpreting which is done in real time in which the interpreter interprets from a booth. 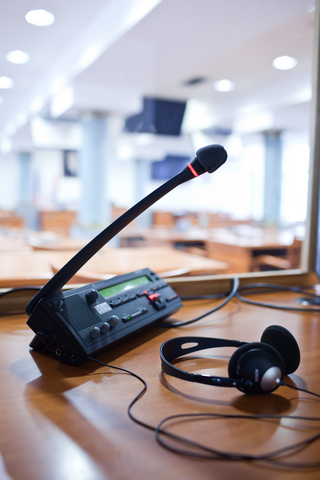 In these cases it is necessary to hire two interpreters so they can take turns. Ideal for congresses, conferences, press conferences, summits, etc. In this case the speaker or a person speaks and pauses for the interpreter to repeat what was said in the target language. It’s a very appropriate type of interpreting for legal and health contexts, school meetings and other situations such as small meetings. For very small groups to which the interpreter whispers so they understand the content of a conference. take turns to speak in your language and understand each other. Filling in this form does not commit you to anything and the quote is free. You will receive an answer within 48 hours on weekdays. Alternatively, you can send an email to fernan@fernan.eu. Detail here all your requests and comments you deem relevant to the interpretation, as the location where it would take place, dates, etc.